This recipe comes from my good friend Alyce, whose tastes I have great respect for. I have made a few changes here and there to adapt it to my family’s size and preferences, but it is pretty close to Alyce’s version. It has been so long that I have been making it that I no longer even have her original recipe, so if I have gone too far astray Alyce, sorry! A traditional tapenade has an olive and olive oil base, but usually includes capers and anchovies and not tomatoes. It is also more finely chopped, made into almost a paste with a mortar and pestle. I love the contrast that the slightly tart sun-dried tomatoes add, and I like the texture of a fine dice instead of a paste. You can also use a food processor to mix the ingredients, but add your tomatoes first (and chop separately) as they will take longer than the olives to chop (and you don’t want olive goo with big chunks of tomato). Kalamata olives provide a stronger taste to the olive mixture: you can adjust the ratio of regular black olives to kalamata as your family prefers. Over time we have gravitated to more Kalamata vs regular black olives, but I still have a couple of little ones who don’t appreciate too much of the stronger Kalamata flavor. This is a great meal that takes very little time to put together (under 30 minutes if your chicken is thaw). If prepared “properly” it can also appeal to a wide variety of tastes (ie pickiness). Almost all of my family will now eat this as shown above, but that hasn’t always been the case. And I do still have one that won’t eat the cheese. 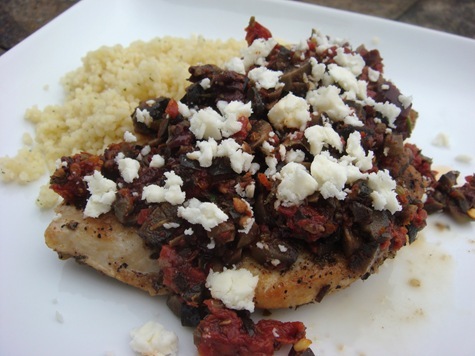 The “proper” preparation/presentation for picky eaters: Serve the chicken, the olive tapenade and the feta separately. The pickiest eater should still eat the plain chicken breast. Those who object to the olive “mush” can just sprinkle cheese on theirs, and those who will never let cheese pass their lips can just add the olive mixture. I like this served with couscous or brown rice. The olive tapenade is really great mixed into that as well! Or as a dip with toasted pita wedges. Or eaten straight with a spoon. Or . . .
Snip sun dried tomatoes with scissors into small pieces. If you are using dry (not oil packed) sun dried tomatoes: combine chopped tomatoes and boiling water. Let sit 10 minutes. Drain. (Oil packed tomatoes do not need to be soaked) Combine drained tomatoes, chopped olives, 2 Tbs olive oil (reduce to 1 Tbs if using oil packed tomatoes), feta cheese**, parsley, oregano, red pepper flakes and pepper. Set aside. Heat 2 Tbs olive oil in a large skillet over medium-high heat. Add thin chicken pieces in a single layer to the hot skillet (you may need to cook the chicken in batches: keep cooked chicken warm on a foil-covered plate while cooking remaining chicken breasts). Sprinkle lightly with oregano, garlic powder and pepper. Cook about 3 minutes per side, until cooked through. Serve chicken topped with tomato/olive mixture. **I do not mix the feta into the tomato olive tapenade. I serve it separately on the side, because I have some who object to the cheese.